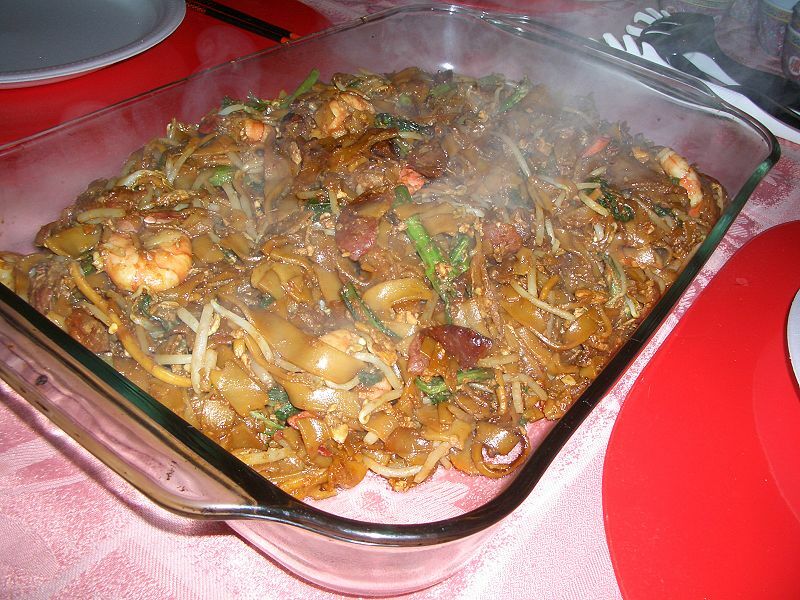 Char kway teow, literally "stir-fried ricecake strips", is a popular noodle dish in Indonesia, Malaysia and Singapore. In Indonesia, the dish is served in Chinese restaurants and traveling street hawker, and locally known as Kwetiau Goreng (Indonesian: fried Kwetiau). It is made from flat rice noodles of approximately 1 cm or (in the north of Malaysia) about half a centimetre narrower in width, stir-fried over very high heat with light and dark soy sauce, chilli, a small quantity of belachan, tamarind juice, whole prawns, deshelled cockles, bean sprouts and liberally chopped up Chinese chives. Variants may include serving the dish with slices of Chinese sausage and fishcake, stir-fried with eggs, preferably duck's egg, or stir-fried with chopped up cuttle fish or cooked crab meat in addition to or in substitution of fresh whole prawns. It is stir-fried in pork fat, with crisp croutons of pork lard, giving it a characteristically rich taste. Most people prefer char kway teow to be served on fragrant piece of banana leaf (suitably washed). When the dish was first invented, it was mainly served to labourers. The high fat content and low cost of the dish made it attractive to these people as it was a cheap source of energy and nutrients. 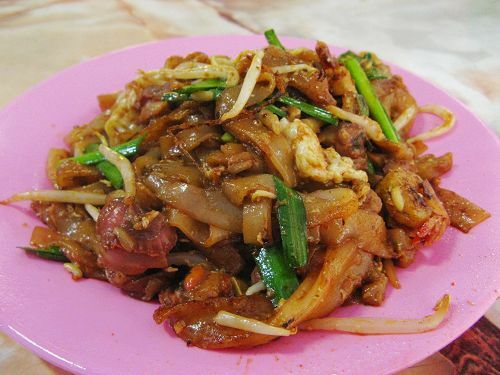 When the dish was first served, it was often sold by fishermen, farmers and cockle-gatherers who doubled up as char kway teow pedlars in the evening to supplement their income. The Indonesian char kway teow is less oily, it uses no lard, and normally uses beef or chicken to cater the majority of Muslim population. But some Chinese restaurants in Indonesia do serve the pork and lard variety.